Two months ago, on June 10, the asteroid 1994 CC passed the Earth at a distance of 2.52 million kilometers. That's about six times the distance of the moon, which is pretty damn close as astronomical distances go. Since our killer laser defense systems aren't ready yet, all we could do was watch as 1994 CC flew by, but it turned out to be well worth the look. Asteroid 1994 CC is a triple system. What that means is that the asteroid that we were aware of has two tiny moons. The central object is about seven hundred meters (less that half a mile) in diameter. If it hit the Earth, it would be big enough to cause a nuclear winter, but not big enough to kill the dinosaurs. Some estimates put the frequency of such impacts at around one in a million years. The satellite asteroids are estimated at least fifty meters across. If either one hit the Earth, it would cause a Tunguska sized explosion--big enough to destroy a large city. Its affect on the climate would be equivalent to a medium sized volcanic eruption--somewhere between Mt. St. Helens and Krakatoa. We have a couple volcanic eruptions in that range every century. Asteroid strikes of that size happen maybe once a century. The impact danger isn't what's interesting about 1994 CC, there are enough dangerous asteroids that this one doesn't particularly stand out. It's the triple nature and small size of 1994 CC that makes it interesting. This only the second triple near earth asteroid that we've discovered. The first was discovered just last year. 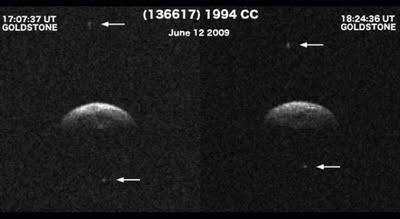 The first triple asteroid anywhere was only discovered in 2005. That asteroid, 87 Sylvia, is much larger that 1994 CC--a half million times larger, or large enough to have a name. Sylvia's satellites are each at least a thousand times larger that 1994 CC. The idea of something as small as 1994 CC having its own system of tiny moons was cartoon material when I was a little kid. This isn't life changing news, but it's pretty cool.